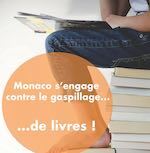 On 6 and 7 March used books are being collected to raise funds for Actes Ressources association. The collection forms part of the efforts of Monaco Mairie and the Monaco Developpement Durable (MC2D) association to reduce waste. It is organized jointly with Recyclivre.